The Chalk Group provinces of England. P895004. The Chalk Group has been in use informally for a number of years. Its first formal use was by Rhys (1974) [Fig.P895014/1] to cover the Chalk in the North Sea and by Wood and Smith (1978) [Fig.P894998/7 and Fig.P895008/5] to cover the whole of the Chalk succession in the ‘Northern Province’ but this also included the Red Chalk (now excluded from the definition as the Hunstanton Formation). Rawson et al. (1978) utilised the term Chalk Formation to cover the whole of the Chalk (Cenomanian to Maastrichtian). Robinson (1986) [Fig.P894998/9, Fig.P900807/2 and Fig.P895005/8] in the North Downs and Mortimore (1986) [Fig.P894998/8, Fig.P900807/3 and Fig.P895005/9], by implication, in the South Downs, used the term Chalk Group to cover the succession from the basal unconformity to the youngest known chalk beneath the Palaeogene unconformity in those areas. Bristow et al. (1997) [Fig.P894998/10, Fig.P900807/5 and Fig.P895005/10] used Chalk Group to include Lower, Middle and Upper Chalk Formations. Rawson et al. (2001) [Fig.P894998/11, Fig.P900807/6 and Fig.P895005/11] formalised the terminology, agreed at the November 1999 meeting, using Chalk Group to cover a lower Grey Chalk Subgroup and a higher White Chalk Subgroup. These divided further into formations. It should be emphasised that the use of the Southern Province terms throughout the Transitional Province must be tested as these areas come up for revision. It is known with some certainty that Southern Province formations can be readily applied throughout the Chilterns and northwards into Cambridgeshire within the scarp facing west over the River Ouse/Wash Basin. The continuity of these formations beneath the thick Quaternary superficial deposits to the east and north needs to be tested. Geophysical borehole records and the interpretations of Murray (1986) show that there is a continuity of widespread identifiable marls seams in Essex, southern Suffolk and further north which confirm a framework of events that are correlated to marker beds in the Southern Province. Of course these geophysical results show inflections interpreted as marls and do not give comprehensive information on the nature of the intervening chalk lithologies. 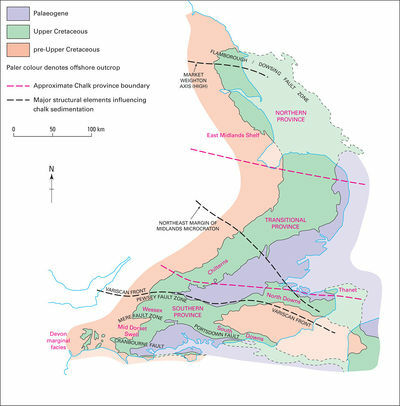 These lithologies need to be characterised to be certain of the use of Southern Province terms but it is envisaged that the formational framework may still be applied widely beneath East Anglia; and that variations in chalk successions may be better attributed to locally named units. It is suggested that such units as are identified be designated as members principally because their ‘mappability’ beneath the Quaternary cover may merely reflect an inappropriate borehole spread unrelated to their true extent. A digest of the development of terminology in the Southern Province (and for the South-east Devon and Norfolk sequences) is given in Figures P895005 and P895006, P895007. The development of the terminology in the Southern Province. P895005. The development of the terminology in south-east Devon (Southern Province). P895006. The development of the terminology in Norfolk (Transitional Province). P895007. The Grey Chalk Subgroup is defined as the succession from the basal Cenomanian unconformity up to the base of the Plenus Marl Member of the succeeding White Chalk Subgroup. It comprises two Formations a lower West Melbury Marly Chalk Formation and an upper Zig Zag Chalk Formation with the boundary between placed at the base of the Cast Bed. Historically this succession has been included within the Lower Chalk which itself has been further subdivided. A short review of the development of the terminology for this subgroup is given below. In the earlier part of the 19th century, the terms Grey Chalk, Chalk Marl or even the combination of Grey Chalk Marl were applied generally to the lowest part of what is now called the Grey Chalk Subgroup. The “Grey Chalk” of W Phillips (1818) [Fig.P895005/1] is approximately coincident with the lower three-quarters of the Grey Chalk Subgroup as presently understood. The presence of Chloritic Marl at the base of the chalk succession was recognised by Forbes and Ibbetson in 1844 (see Jukes-Browne and Hill 1903). In 1877, Price used a classification of the Lower Chalk at Folkestone that separated marly (more clayey) Chalk Marl from an overlying more carbonate-rich Grey Chalk (not to be confused with the “Grey Chalk” of W Phillips). This scheme was used in his classification of the Lower Chalk by Jukes-Browne and Hill (1903) [Geological Survey Memoir on the “Lower and Middle Chalk of England”]. They retained selected traditional lithological names from the 19th century, including Chloritic Marl, Chalk Marl, Totternhoe Stone and Grey Chalk, and introduced two faunal zones in the Lower Chalk; a lower Schloenbachia varians Zone (equivalent to the Chloritic Marl and Chalk Marl) overlain by the Holaster subglobosus Zone (Grey Chalk and Belemnite Marl [Plenus Marls Member in present usage]). They noted that the lithological divisions could not be recognised everywhere; for example, the succession equivalent to the Chalk Marl of south-east England comprises hard white and grey chalk containing little clay in north Norfolk, Lincolnshire and Yorkshire (see following section). Furthermore, they did not recognise the Totternhoe Stone (or equivalent) south of the Thames, making separation of the Chalk Marl and Grey Chalk very difficult south and west of Berkshire. They circumvented problems posed by these lateral variations in lithology by describing only the corresponding biostratigraphical divisions in areas where the Chalk Marl and Grey Chalk could not be separated lithologically. However, where possible, Survey Memoirs referred to lithological units and a fourfold division at ‘member’ level was widely recognised in England, south of northwest Norfolk: Glauconitic (Chloritic in early texts) Marl, the Chalk Marl, the Grey Chalk and the Plenus Marls. An upwards decrease in clay content (of 10 to 20%) from the Chalk Marl to the Grey Chalk occurs gradationally over a considerable (but laterally variable) thickness of the succession and the boundary can be difficult to recognise especially in incomplete inland exposures. In the Boulonnais of northern France, this difficulty has been overcome by the creation of a separate “Formation” for the transitional unit. In Berkshire and farther northwards, a major erosive event cutting into the Chalk Marl is found everywhere, and a condensed transgressive lag deposit (Totternhoe Stone), forming the lower part of the Grey Chalk, rests non-sequentially on various levels of the Chalk Marl. This event is equivalent to the transitional unit between the Chalk Marl and Grey Chalk, and marks the boundary between them. In the southern outcrop this event is represented by the Cast Bed (Price, 1877). It is used, together with the Totternhoe Stone farther north, to define the base of the newly formed Zig Zag Chalk Formation, thereby removing one of the long running arguments in Chalk correlation. Robinson (1986) [Fig.P895005/8] introduced an entirely new lithostratigraphy for the North Downs by dividing the strata previously described as Lower Chalk into three formations. The lowest East Wear Bay Formation (equivalent to the Chalk Marl and lower part of the Grey Chalk) is characterised by its rhythmicity; the middle Abbot’s Cliff Formation comprised massive slightly marly chalks, and the Plenus Marl Formation found at the top. He split the Abbot’s Cliff Formation into two members, the Hay Cliff (equivalent to Jukes-Browne Bed VII) and the Capel-le-Ferne Member. Robinson makes no mention of the Cast Bed but it is evident from Kennedy (1969) and more succinctly in Gale (1989) that it occurs in Kent and would adequately divide the East Wear Bay Formation. Bristow et al. (1995) [Fig.P895007/4] created a new lithostratigraphy for the Lower Chalk in the Shaftesbury area of Dorset, and subsequently applied it, with modifications, across southern England (Bristow et al. 1997) [Fig.P895005/10]. Originally they included the Glauconitic Marl (known locally as the Melbury Sandstone) in the Upper Greensand, and split the Lower Chalk into 2 members; the West Melbury Marly Chalk and the Zig-Zag Chalk members. Subsequently the Glauconitic Marl/Melbury Sandstone was considered to be the basal bed of the West Melbury Marly Chalk Member because it was demonstrably of Cenomanian age and rested on a significant erosion surface. The boundary between the West Melbury and Zig Zag members, thus defined, was marked by a topographical slope change. This topographic feature coincides with the top of the thin Tenuis Limestone, where the full succession (rarely) exists, but is better defined by the base of the overlying Cast Bed (a lateral equivalent of the Totternhoe Stone). This boundary is some distance below the ‘traditional’ Chalk Marl - Grey Chalk boundary as supported by Gale and Hancock (1999) but does represent a marked upward decrease in clay content. The Cast Bed is equivalent to bed C1 of Gale (1995). In the most westerly outcrops of the Chalk Group in Devon (Jarvis and Woodroof, 1984) [Fig.P895006/7] the lithology of the Grey Chalk Subgroup changes and the new nomenclature at formation level is difficult to apply. The term Beer Head Limestone Formation (which is equivalent to the Grey Chalk Subgroup) will be used on the Sidmouth (326, 340) and westernmost Bridport (327) geological sheet areas to cover the succession below the Holywell Nodular Chalk Formation. The first attempt to characterise any chalk units, which we might nowadays consider “members”, was by Whitaker (1865a) who described the Broadstairs Chalk and Margate Chalks as discrete lithological units with type localities. The ensuing decade saw a succession of papers naming chalk units after localities in Kent (Dowker, 1870) [Fig.P895005/2]; (Whitaker et al., 1872) [Fig.P895005/3] and Surrey (Evans, 1870) [Fig.P895005/4]. Evans named units have not been employed subsequently, but those of Whitaker and Dowker were used by Robinson (1986) [Fig.P895005/8] and Gale et al. (1987) and taken to have member status in a modern sense. A monograph by Barrois (1876) [Fig.P895005/5] also pioneered the zonal stratigraphy of Hébert in Great Britain, and every time he used the term Chalk with a prefixed locality (i.e. Portsdown Chalk, Brighton Chalk, etc) he showed clearly which zone it belonged to. However, the units cannot be considered to be lithostratigraphical. The pattern of stratigraphical usage for the succeeding 100 years was set by Hill (1886) [Fig.P895005/6], who used the terms Lower, Middle and Upper Chalk, which were subdivided into Hébert's assemblage zones and retained other informal named lithological units. 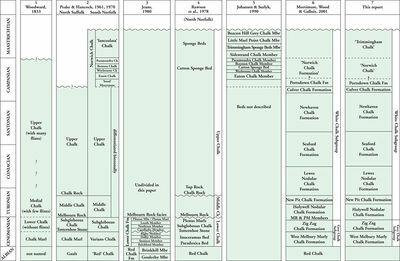 Following the work of Rowe (1899 to1908) (see discussion in Gale and Cleevley, 1989) assemblage zones were used exclusively to subdivide chalk successions until the 1980s. However, lithological features and named beds were used continually as an aid to mapping, as with the case of the Middle-Upper Chalk boundary in the North Downs, and the feature-forming Chalk Rock and Melbourn Rock. In addition to the work of the Survey, the first authors to introduce a lithostratigraphical scheme for the Chalk were Peake and Hancock (1961) [Fig.P895007/2] who placed Late Campanian to Maastrichtian chalks of north-east Norfolk within a series of informal members named after localities near Norwich and on the coast (e.g. Eaton, Weybourne and Beeston Chalks). Johansen and Surlyk (1990) [Fig.P895007/5] gave these units formal member status. Jarvis and Woodroof (1984) [Fig.P895006/7] provided a lithostratigraphical subdivision of the Middle Chalk of Devon, which they placed within the Seaton Formation. They created two new members (Connet's Hole Chalk and Beer Roads Chalk). Bromley and Gale (1982) described the lithostratigraphy of the hardground complex called the Chalk Rock, which they took to be a formation. Mortimore (1983, 1986) [Fig.P895005/9] published a new lithostratigraphy based on the South Downs for what he called the Sussex White Chalk Formation within which he created 6 new members with distinctive lithologies each with stratotypes in Sussex, Hampshire and the Isle of Wight (Ranscombe, Lewes, Seaford, Newhaven, Culver, and Portsdown). 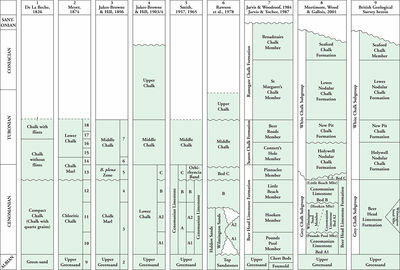 Each of these units was demonstrated in field meetings of the Geologists’ Association in 1977 and 1980. This precedent and guiding ethos was used by Robinson (1986) [Fig.P895005/8] to create a separate lithostratigraphy for the North Downs. He in effect treated the Chalk as a group, and divided the White Chalk into two formations (Dover and Ramsgate) approximately equivalent to the Middle and Upper Chalk. These formations were divided into six members, three of which were taken from earlier researches (St. Margaret's, Broadstairs, Margate members). Mortimore (1987) suggested a correlation between his 1986 South Downs scheme and Robinson’s (1986) North Downs scheme, successfully applying his Sussex terminology to the Kent and Surrey succession. In reply, Robinson (1987) claimed that the succession in the North Downs differed from that in Sussex and required a different nomenclature. This has substantially not proved to be the case. Gale et al. (1987) attempted to construct a compromise between the Mortimore and Robinson schemes, based on first usage priority of names, and incorporating some pre-zonal names employed by Robinson (1986) and many of the new ones of Mortimore (1986). This classification differed from the 1986 papers in one important respect – the concept of the term member. For both Robinson and Mortimore, members were recognisable along the entire outcrop, defined precisely by marker beds, and essentially synchronous. However in the Gale et al. (1987) scheme, some lithologically distinct members were recognised locally over a few square kilometres (e.g. Downend Member, Whitecliff Ledge Member) whilst others were recognised over hundreds (e.g. Chalk Rock Member). Gale et al. (1987) also introduced the term Studland Chalk for the unit of flinty, marl-free chalk that overlies the Portsdown Member of Mortimore but it has not proved mappable. The term Portsdown Chalk Formation is utilised herein to cover the highest outcropping chalk in Southern England. Mortimore (1988) provided a detailed criticism of the Gale et al. (1987) scheme. Subsequently, Rawson (1992) suggested a correlation between the schemes of Robinson (1986) and Mortimore (1986). Mortimore and Pomerol (1987) extended the scheme developed in the South Downs (Mortimore 1986) to the Paris Basin, and traced the members and many marker beds across the Channel, through Normandy and Picardy to the Valley of the Yonne. It should be noted that other schemes of classification exist for the Chalk of the Pas de Calais (Robaszynski and Amedro, 1986) and Normandy coast (Juignet and Breton 1994) but that most recently the French state survey have shown an interest in applying the lithological framework defined herein across the Chalk of northeast France. Gale (1996) provided a detailed account of the lithostratigraphy of the Turonian chalks of southern England, and introduced one new member, the Ballard Head Chalk, a replacement name for the Melbourn Rock of the south coast, sensu Mortimore (1986). Following the introduction of the first detailed truly lithostratigraphical schemes for the Chalk of the ‘Southern Province’ in 1986 the British Geological Survey (BGS) began to question the appropriateness of the ‘traditional’ scheme. Thus, mapping of the western South Downs, east Hampshire and Wiltshire – Dorset areas by the BGS in the 1990s established a close correlation between units mappable across these areas with the scheme devised by Mortimore. 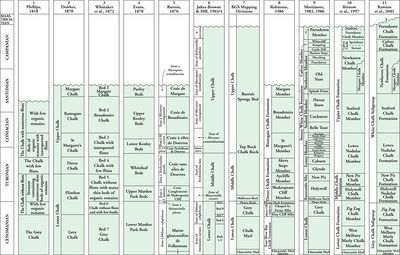 A unified lithostratigraphy for the mapping of the Chalk was published (Bristow et al., 1997) [Fig.P895005/10] following a BGS meeting at Wallingford on the 9th June 1994. This scheme has been further modified by agreement at the Chalk Lithostratigraphy meeting held at BGS Keyworth in November 1999, resulting in the short letter published in the Geoscientist (Rawson et al., 2001) [Fig.P895005/11] and demonstrated more fully on the Geological Society’s Web Site. The principal elements of that new stratigraphy are presented in Figure 3 and are described below [see Fig.P895005/10 and P895005/11]. The following definitions cover the New Chalk Stratigraphy as promulgated in Rawson, Allen and Gale 2001 following the joint stratigraphical framework meeting held at BGS Keyworth in November 1999. As such they should be taken as the standard nomenclature in all future BGS publications in the Southern (including where possible the Transitional Province) Province of England. The lithostratigraphical units utilised on the 1:50 000 Geological maps and within the descriptive memoirs of the Southern and Transitional Provinces of England. This page was last modified on 5 February 2015, at 18:07.